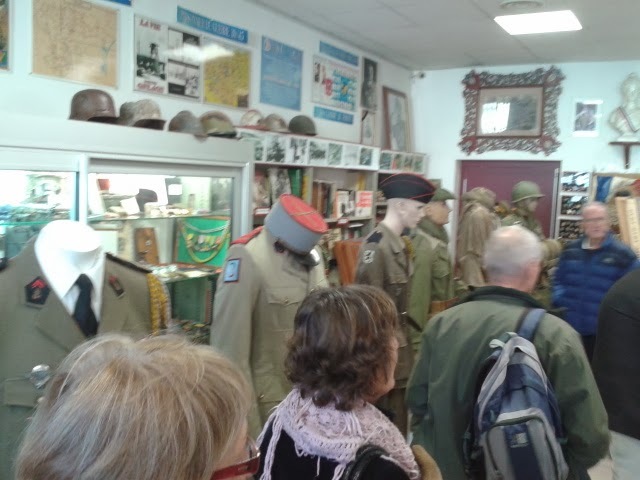 Friday the 13th, I went with our french class to have lunch together in Carcassonne and also tour the War museum there. They were having an exposition about the time between the two world wars. I had a great time visiting over lunch and touring the museum. The exposition was real good and I learned a lot of History as well as insights to that generation. The 7th, we were invitied to attend a Pantomine in English. This is a play with interaction with the crowd (a british thing). We had a good time, the kids really enjoyed it. Above they went up on the stage to help the crowd learn a song. Friday the 14th, we had a Christmas dinner with the church in Carcassonne. We invited a family from Limoux to come. We had a great time of food and fellowship. And some heard the Christmas story for the first time. 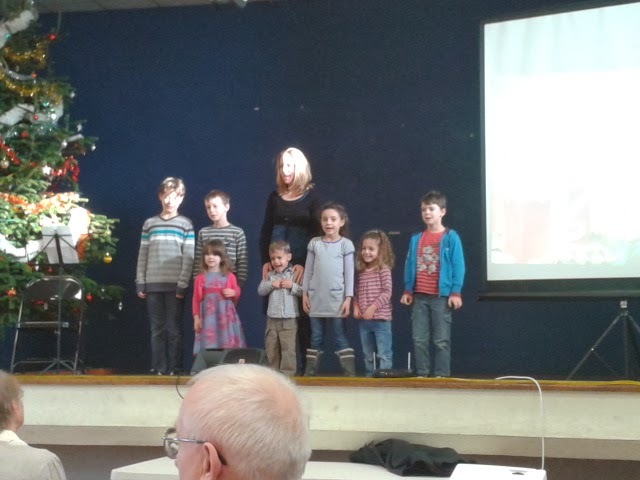 Pictured above is the kids singing a Christmas special. The following Sunday afternoon we attended the kids basketball tournament. That evening for our English worship service we had guests, a British couple visited in our English services, as they had in our French services the Monday before. The following Tuesday, the 17th, was Caleb's 11th birthday. He had a small party Wednesday with two of his friends. By this time, Christmas was in full swing. I was busy helping a friend move out of a house he just sold. It was a lot of work because the house was an hour away up in the moutnains and we were working in snow and ice. He really appreciated the help and I was also able to give him spiritual counsel. The kids last day was Friday, but I had an all weekend training sessions for Coaches. 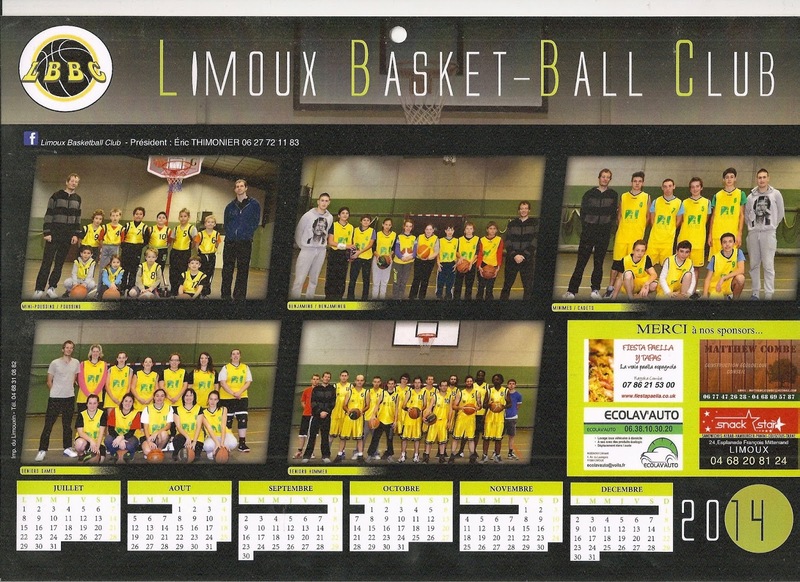 It was long, but I enjoyed it, and was able to renew some contacts made with the basketball outreach last June. The Sunday night before Christmas we got together at Laurens for a special English Christmas service and pizza. Lauren shared a book about the Christmas story, and we also made some crafts that Lauren's parents had sent for the kids. Monday before Christmas, everyone was occupied for the adult Bible study, but Lauren had a lesson with our kids, they decorated cookies as well. Tuesday, Christmas Eve, Lauren came over for a Christmas Eve dinner of chicken and dressing. For Christmas day, the kids made it to 7:00 before Christmas started. They opened the first wave of toys with just us. Then Lauren came over and brought the second wave of toys that she had brought for them..Then came the third wave of toys that Lauren's parents, and some members of their church had sent. The kids were spoiled as usual. Arianna is sporting her Princess outfit. Just woke up and ready to go. Let me try and summarize the last two weeks. Thanksgiving! One of my favorite times of the year. We were going all out this year with 40 people invited to our Thanksgiving meal. Monday morning, I prepared the Bible Study, and the quiz that I would be handing out for Thanksgiving. Monday afternoon we had our weekly meeting with Lauren to plan things out for the future. We finallized athe plans for Thanksgiving, discussed the English services Sunday night to see how we could improve them, and planned for a group coming in June. Monday night, after running Angie to her palates class, Lilia to swimming, Bible study went well. Lauren is continuing to teach the kids on Monday night and it is going well. Tuesday morning, I met with out French class, Angie did some shopping. Tuesday afternoon, I had my computer class which went well. There were a few new students and we talked about connections (VGA, HDMI, USB, WIFI, Bluetooth, 4G, etc.). Pictured below is the class from Friday evening. Tuesday evening at Basketball practice,while confirming the presence of my teammates, I realized that everyone had planned on bringing their children (surprise), meaning in a room for 40 people we would have about 60. Thus began the scrammble to add the those we already had avlaible to watch our kids so that we could provide babysitters for those who did not have any and wanted some. Wednesday, the cooking began. Thankfully we had Lauren to help divide the workload with.We were responsable for the rolls, sweet potatos (just the baking), String bean casserole, devilled eggs, cheesecake, cranberry sauce, ice tea, and wassail. I do not think I have ever seen such large pots so full. . .
Wednesday afternoon's basketball practice went well. Getting the kids ready for another tournament mid-december. Wednesday night, Angie and Lilia had practice. We took team pictures at practice because the club is planning to have calenders printed to sell. That seems to be a popular thing to do. Several times a week we have people knocking on the door selling calenders. Thursday morning I met with my language helper as usual, we went over the Bible study text and also the quiz to make sure everything was well written. I usually make errors when writting with the grammaire still, and occasionnally I write a word how it sounds orally but not how it should be written. Thursday morning and afternoon, I continued to help Angie cook, we took a break the afternoon to go pick up the keys for the room we have rented. This room is provided by the mayors office for 100 euros. It was nice and clean. Someone had reserved it on Friday night and it was ours all day saturday (foreshadow). Thursday evening, Lauren invited us to have a more personnal, relaxed thanksgiving meal with her. Pictured below. Very nice and appreciated. Friday Morning, Angie and I had a meeting to renew our visa's. The process goes well, we have the routine down. Thankfully next year we will be able to apply for a ten year visa, and stop having to go every year ( and pay every year) to renew. We also pickud up a few things from the store and borrowed some tables and chairs from the church in Carcassonne. Friday afternoon, cooking again. Friday evening I had my other computer class. Lilia went with me because right afterwards we had a Trophy ceremonie for all the sports clubs. Our basketball team was awarded for getting second place and Lilia was awarded for getting third with her school swimming team (pictured below). Saturday was the big day. Caleb and I went first thing in the morning to get the heat turned on in the room, only to find out that the place was covered with red mud and dirt. We spent the better part of an hour sweeping and mopping. I took plenty of pictures to show later and complain. After we stopped by the store, we took Angie's place so they could go set up the decorations. Lauren planned out the decorations and did a good job. We got everything cooked up. Our friends who do the turkey for us every year brought it over, cooked, sliced and ready to serve (what a blessing!). We made our way over, several trips in both cars, and around 7 started welcoming our guests. We sat and started eating around 8:30. It went wonderfully. Inbetween courses I would go over teh quiz, or talk about the history of Thanksgiving, or lead in a prayer. Everyone enjoyed most of the food. We had more that enough. There ended up being right at 40 and only 7 kids. Before the dessert, I had everyone change places to get to know more people. Everything was finished up around 11. We made it back to the babysitters around 11:30. Stayed and visited with them and other parents until about midnight. Angie crashed on the couch right away. I stayed up until 1:30 putting things away and getting ready for Sunday. The biggest news from the last two weeks would be the rain. 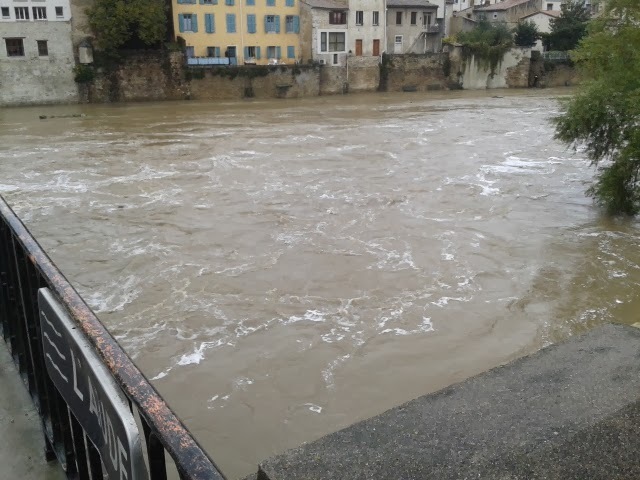 We have had rainful almost constantly it seems. For 8 days straight we had rain, and for at least 3 of those days it was non-stop. I don't know if you can see in the above picture, the rocks peeking up out of the water on the far side. That marks the edge of what is usually a parking lot. Currently the weather has gotten colder, and we are getting sleet mixed with rain. Things are going well with the AVF, we had a meeting last week and I was voted to be vice-president. I am enjoying the computer class, each time we meet, it seems there are new students. I think there are about 15 now. We had a dinner with the AVF yesterday. I had a great time meeting everyone, and had some good conversations about religion and our church planting efforts. There were about 70 present. 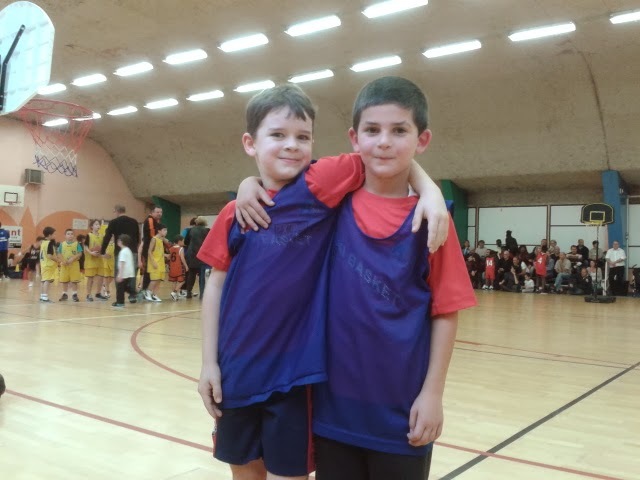 Sunday, the boys had their first basketball tournament of the season. They played three games, lost the first one 0-2, and won the next two 2-0 and 14-1. They had a good time playing and everyone scored. I hope that reflects my coaching skills. Bible study is going well. Along with Lauren we have some things planned for the future. We will soon have a kids Bible study time during the adult Bible study. We are also looking at the possiblilty of having English courses, and maybe some groups coming. The 31st, we had our first home game, and being on a Thursday, I was able to attend. We had a good game we won by 14. I played well, scoring 16 points. There were a good amount of fans present, and Angie and the kids enjoyed visiting with everyone during the game. Early Friday morning, Angie and Lilia left for weekend with the youth at a camp north of Toulouse. They had a wonderful time, and praised the music, the sermons, the activities, pretty much everything. Lilia is picture below, with two youth from Carcassonne. Meanwhile, I hung out with the other kids here at home. Friday was a holiday, and we just chilled out at home and played outside. Saturday, I wanted to build a cat toy with the kids. 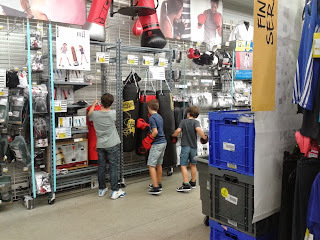 We went and bought the stuff we needed and had a good time working on it with the kids. They did most of the work, I was only there for the heavy lifting. I even made the boys do all the math. So here is what came out of a couple of outdoor rugs and some scrap wood we had laying around. Sunday services went well, we stayed and ate, which went well, in spite of the absence of Angie. They made it back late Sunday afternoon. Monday, my computer started acting up, which started a week long process. I was able boot it up and back it up slowly and by rebooting multiple times, before it stopped loading windows at all. Then, after trying restores and repairs without any change, I was forced to restore it to the factory default, and start the process of putting all the free software back on. Thankfully I was able to back everything up. Bible study went well Sunday night, we are continuing the study of John and enjoying good discussion. Tuesday morning, Angie and I had our AVF French class, and Thursday afternoon, I had my AVF computer class, which went real well. Our subject was computer security and there were five new students. Several of which talked with me afterwards, asking why I was in France, which I gladly explained. Tuesday evening we had basketball practice. Wednesday, I worked on the computer more and had a visit that afternoon and had basketball practice with the kids, getting ready for our first tournament soon. Thursday morning I got the computer up and running and started loading software. Thursday afternoon, I gave the guitar lessons. Thursday after getting the kids from school, I had meet the teacher night with Caleb. It went well even though we only were able to see two teachers because of long lines, but I did get to visit some with other parents. 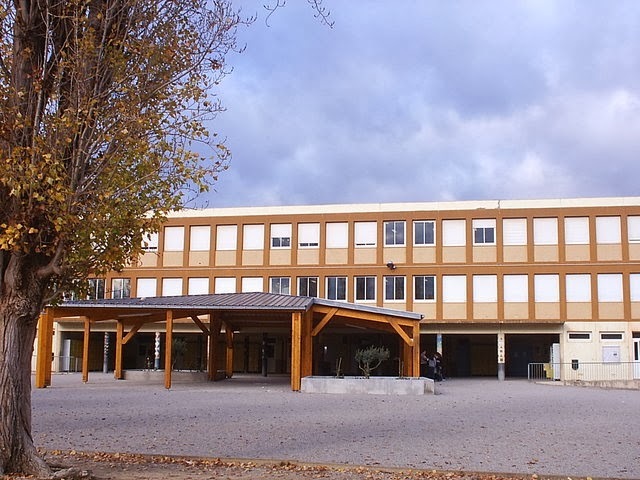 Below is the main building for Caleb and Lilia's school. It has been two weeks since I posted, in French they would say 15 days. Don't bother adding it up. The kids have been out of school for most of this time. They have two weeks off from school, called All-saints Vacation. All-saints day is Friday, a day where the French typically place flowers on the graves of loved ones. My missions treasorer passed away yesterday morning, John Richard served France Missions for the past 6 and a half years. I am thankful for his support for us and for his service in this area. As I mentioned before the kids get two weeks off from school every six weeks. Angie asked each of the kids what they wanted to do during the vacation. Many responses were heard, among them, making cookies . . .
Lilia has been consumed recently by a desire to make self-portraits for her facebook page. She took over 150 these past few weeks. I don't complain at all, because it's not a bad pastime, and she is very pretty. One day we adopted a cat. Angie walked in the door after dropping Lauren off with a cat in her arms. I am not a cat person per-say, but this is a well behaved cat. Evidently she had been living on the street for some time. She is calm, doesn't jump on stuff, is good with the kids, and seems to really enjoy being fed regularly. Also she is house trained, which is a big plus. Sunday I led the services at Carcassonne. I volunteered on short notice because the man who normally was assigned to do it was traveling to see family. The services went well, I enjoy leading occasionaly without reading my notes. Even though I make more grammaire mistakes that way, it still feels more natural. There was a tense moment while I was bringing the devotional before preaching, when a large 8 feet mirror came unglued from the wall of the meeting room and leaned/fell onto the people sitting next too it. Thankfully no one was injured besides a bump on the head and thankfully the mirror did not shatter. The church in Carcassonne just sold their old meeting place and is looking for a new one. The dance hall they currently rent is expensive and now there is a problem with falling mirrors. Sunday after church we took advantage of the presence of Lauren to try and take some family portraits. Always a stressful time for the family, as getting 7 people to sit still and small seems to big a large challenge. It did result in some good candid shots. The girls did manage to get a good shot out of the event. Let me think. . . the last week went well. We are finally getting into a routine. Though last week was a little different because Lilia had sprained her ankle and did not go to her swimming class. Friday evening I had my fist computer course. Four students were present, and on Tuesday afternoon, four more came. Looks like it will be a good class, they shared a lot of things that they would like to learn. Friday night, I camped out with the boys in the back yard. They had a great time, except for the fact that it got down to around 40 degrees, so by morning only Caleb and I were left in the tent, freezing. For breakfast, I cooked eggs for them inside a grapefruit. We also made chinese yo-yos, made with a large button and string. Angie took the boys one day to get some new shoes, they got a little distracted as you can tell. 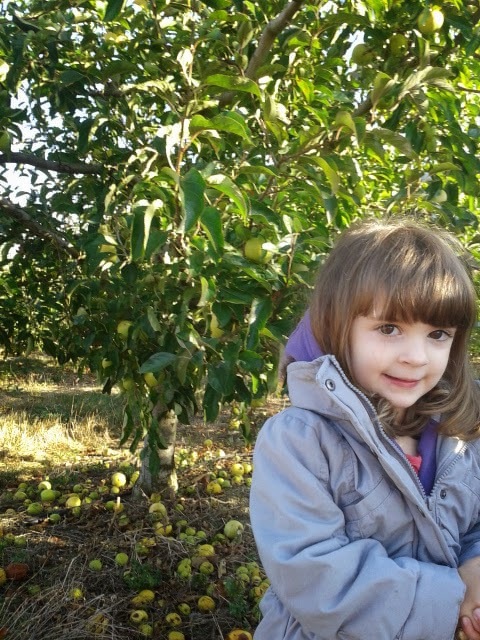 Monday Arianna, went on a field trip to pick apples with her class. Angie went along and helped out. They had a good time and Angie even had the opportunity to talk to the class about saying things in English. Saturday the girls went to Arianna's baby gymn class. Arianna really enjoys all the activities. And we are enjoying meeting the parents. I coached the Jr High class at basketball last Wednesday because the usual guy was absent. The boys have got a lot of energy. I am considering a position with the AVF, I'll go into more detail later, but pray for us, because it would take a dedicated amount of time each week. But the good side, is it would put me in a position to get to know the 250 members. Let me catch you up on the highlights of this past week. Thursday the 26th was Angie's birthday. I made he a baked potato cake. You would have to know how much she likes potatos to understand. Saturday, we celebrated Micah's birthday party. He had four friends over and they had a real good time playing together. He likes fansy cakes. So we made him a castle cake this year. Lauren is getting settled in. She is doing well in language school and is making better progress that I did after one week in. Angie has enjoyed taking her shopping everywhere to help furnish her apartment. Pictured above are some dishes that someone passed on for free. We have got her water turned on, and should soon have the electicity in her name. She has her home phone and internet that should arrive soon. Lilia started swimming last week. Caleb is doing well in school, and so are Micah and Andrew. Andrew is excited because he goes twice a week to swim during school hours. Arianna is doing well also. Yesterday she fell and hit her head on the playground, nothing serious, but the teachers were trying to understand what she was saying. They said that she speaks to them real quietly and they have trouble understanding. Her teacher invited Angie to come and speak to the class about America. What a great opportunity! Micah Celebrated his 9th birthday Friday night. Just our family and Lauren were present. His party will be this saturday. Angie made a cake for him to take to school to share with his classmates. I decorated it with his name.